Some of the best rodeos of the season are on the July schedule. True, it is hotter than blazes in some areas where rodeos show during the summer, but it doesn’t seem to deter the crowds, perhaps because of the ice cream, snow cones, and frozen lemonades now available at the concession stands, but more likely it is the connection to July 4th celebrations. This past July there was discussion on Facebook and in connection to an article about dwindling knowledge of proper etiquette during the singing of our national anthem. Because I have strong feelings about this, when I attend a sport event or assembly, I pay attention to the behavior of others while the flag is presented. Sometimes people remain seated (referring to those who do not have a physical impairment that makes it difficult for them stand), or people fail to remove their hats, or they continue conversations — worse, are those on their cell phones. This prompted the question as part of that Facebook dialogue about who is responsible for teaching proper etiquette. Some blame public schools for not doing so; others fault parents. I would argue it is all of us. A good place to start making change is by being an example. In my observations, I have noticed audience members who know the protocol, who provide good examples and who consistently do so while attending American rodeos. There, a greater majority of participants and spectators remove their hats, immediately cease conversations, stand to attention, and silence their cell phones during the singing of the national anthem and during the display of the flag. Why the difference at rodeos? Simply put, it is rodeo’s heritage. 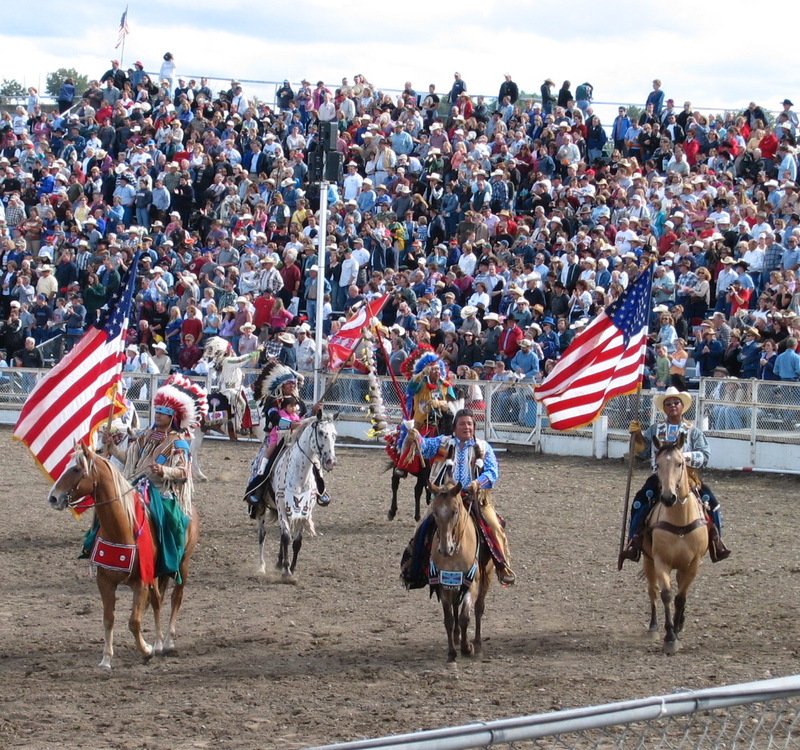 The first rodeos were organized not just to display the skills of local cowboys, but to include the surrounding communities and commemorate America. Many early competitions were scheduled in conjunction with Independence Day celebrations or weekends closest to July 4th. As rodeo evolved, producers alternated events where cowboys and cowgirls competed with intermissions that included live productions or plays telling a brief history of America, or honoring local war heroes. 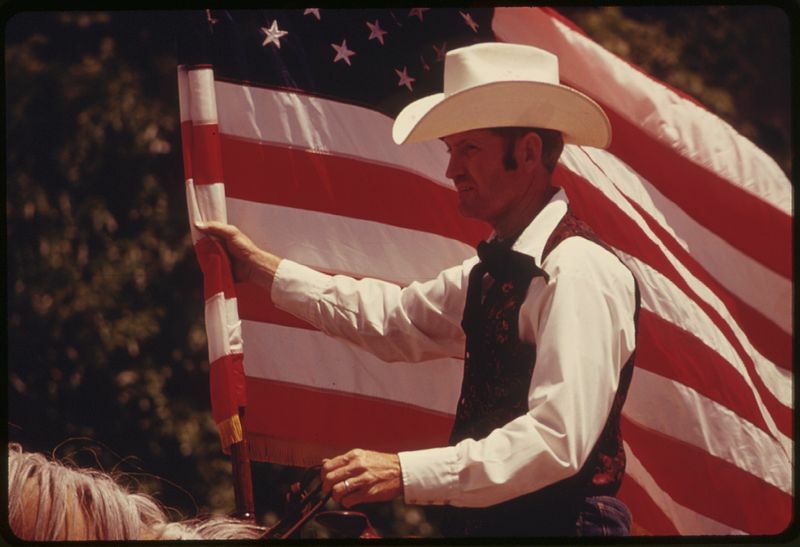 This practice of reverence for veterans expanded after World War II partially because the exponential contributions to the war effort affected everyone across the country, but also many cowboys who served in the military during the war returned to rodeo careers or to Hollywood as cowboys becoming famous in both areas. Audie Murphy even had an arena named for him and for a brief time, a rodeo in his honor in his home state of Texas. 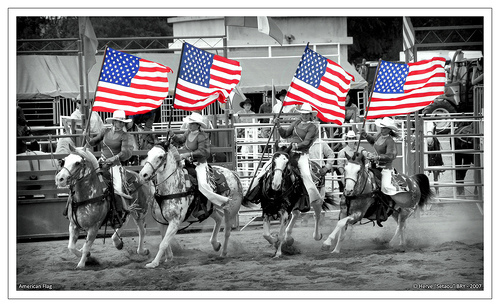 I once heard a first-time attendee state that rodeo people were hyper-patriotic; perhaps, but in a society that cannot seem to identify who is responsible for teaching proper manners during the national anthem or posting the colors, or even respect for individuals who serve, aren’t we fortunate to have a community willing to stand up and remind us all how?